​ It should come as no surprise that the Texas economy has outperformed most states and the United States as a whole over the last decade. However, it may be surprising to learn that by the end of 2015, 11 states still had not returned to their prerecession employment levels. 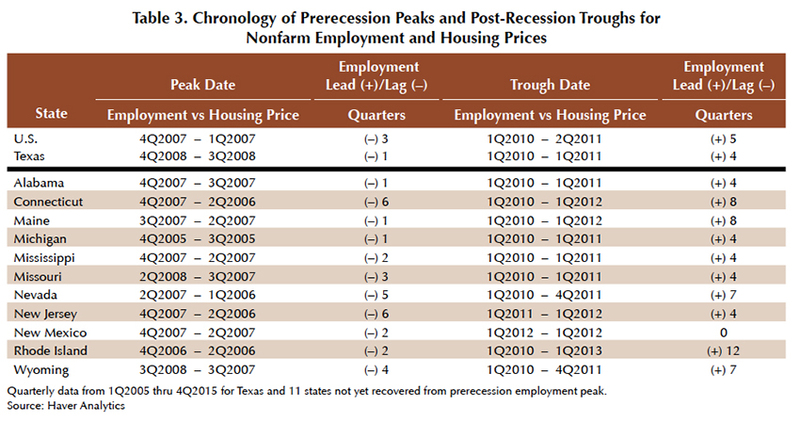 Texas had matched its prerecession nonfarm employment peak by the end of 2011, a period of only three years. The U.S. took seven years, attaining parity in 2014. Based on the Federal Housing Finance Agency’s (FHFA) home price index, home prices in ten of those 11 states also had not returned to their prerecession highs by the end of 2015. Housing prices in the U.S. ended 2015 barely above their prerecession peak as well. While Texas recorded a small dip in home prices during the recession, it was nothing like the double-digit drops in many states. Why did Texas employment and home prices perform so much better than the 11 hardest hit states and the U.S. overall during one of the worst economic downturns in decades (Table1)? The general thought is that a boom in oil and gas activity occurred at just the right time to carry Texas through the recession. That is indeed part of the story, but head-to-head data comparisons reveal that Texas has been at a comparative advantage for some time. Eight of the states that had not recovered experienced net outmigration over the entire 11-year analysis period (Table 2). Connecticut, Michigan, New Jersey, and Rhode Island have seen net domestic outmigration every year since 2005. By contrast, Texas experienced fairly consistent positive domestic migration, indicating long-term economic attractiveness relative to other states. Relocations occur from being “pulled to” a new location, “pushed from” an existing one, or both. Individuals may be pulled to other states by the prospect of better jobs, more affordable housing, or better climate. They may be pushed to leave a state by such things as job loss or a particularly burdensome tax structure. All domestic migration, either positive or negative, was generally restrained during the height of the recession in 2010 and 2011. This would be expected as individuals often find it difficult to relocate during recessions. Possible reasons include perceived lack of better economic opportunities elsewhere, decline in home values below a homeowner’s mortgage payoff, or simply fear of change in uncertain times. The percentage of decline in both total nonfarm employment and home prices reveals how hard some states were hit during the last recession (Table 1). While Texas only suffered 4 percent declines in both categories, Nevada was saddled with an almost 60 percent decline in home prices. Nevada’s total nonfarm employment dropped 14.9 percent, but employment in the construction sector dropped a devastating 67 percent peak to trough. 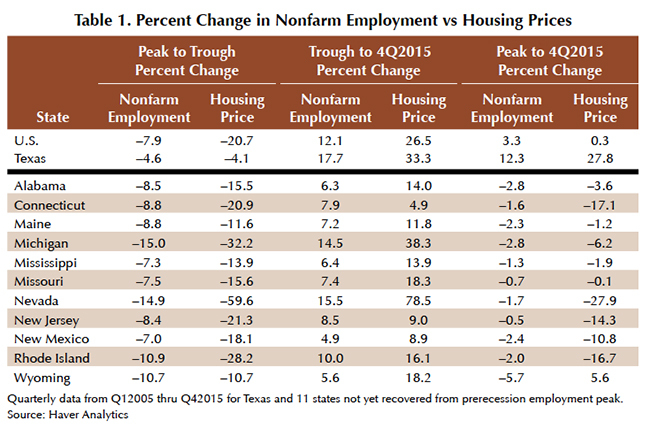 A consistent pattern emerged when comparing the magnitude of employment and housing price declines in the U.S. and every state except Texas, where it is about the same (Table 1). The housing price troughs were always greater than the employment declines. One possible explanation is that Texas avoided the residential home overbuilding that other states did not, which caused housing bubbles that collapsed and led into the recession. The same pattern is observed in the recovery that occurred from the troughs to the end of the analysis period, except in Connecticut. Housing price rebounds were always greater than the rebounds in nonfarm employment. 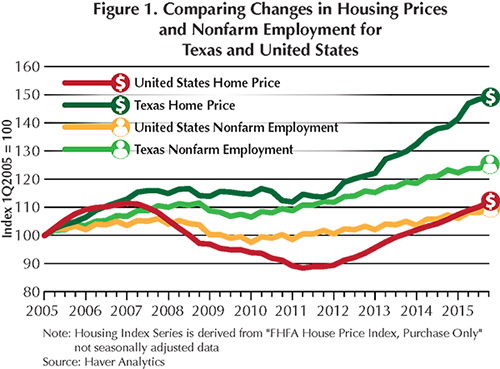 The trend toward greater change in home prices than in employment for Texas and the U.S. overall is shown in Figure 1. The data are indexed to a starting base of 100 in 1Q2005, which creates a level playing field for examining the changes in magnitude during the analysis period. 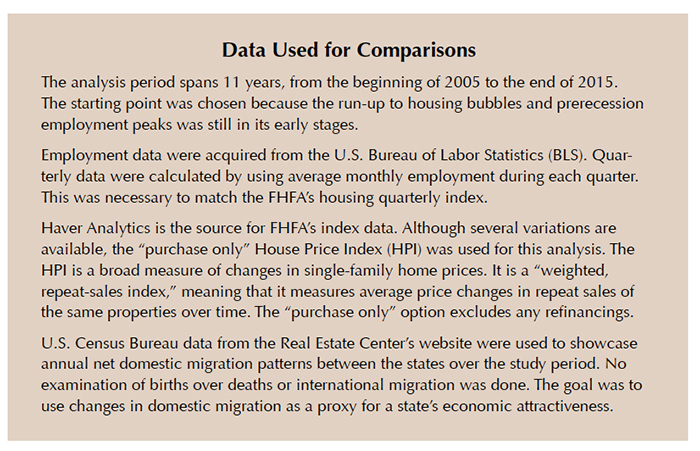 The U.S. home price bubble is obvious in the early years (Figure 1), a trend not present in the Texas housing prices. Over the analysis period, nonfarm employment peaks always occurred after housing prices had peaked. The range of lag times varied from one to six quarters (Figure 1 and Table 3). Furthermore, nonfarm employment always reached a trough before housing prices, except in New Mexico where it occurred simultaneously. Lead times ranged from four to 12 quarters. Employment reaching a bottom before home prices would be expected. Declining job growth would typically lead to an expectation of further job losses. This should continue to negatively affect home prices until a turnaround in employment changes market expectations to future job growth. Prerecession housing prices peaking before employment was not expected. Logically, employment would peak and then begin a decline before home prices break over and follow employment down. After seasonally adjusting the data, employment did in fact decline before home prices, as would be expected. Nonfarm employment is divided into two categories: service-providing and goods-producing employment. The percentage of jobs in each at the beginning and the end of the study period is shown in Table 4. The change in these percentages shows a shrinking percentage of jobs in the goods-producing sector. The shift to more service jobs, which has been occurring for several decades, is observed in the U.S. as a whole and every state except Wyoming. 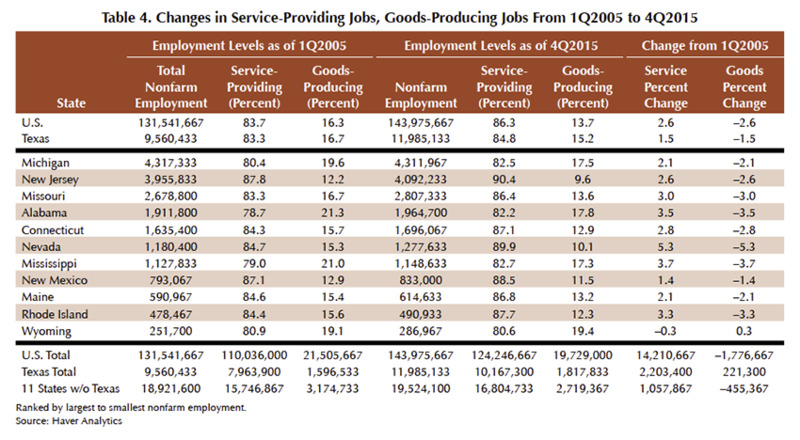 By 4Q2015 eight to nine out of every ten jobs were service-providing jobs, depending on the state. Texas had an absolute increase of 221,300 in goods-producing jobs between 2005 and 2015. 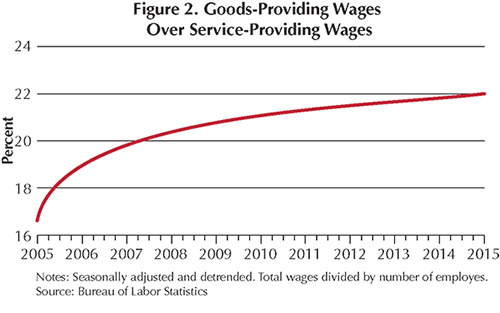 However, the much larger increase in service sector jobs still caused the goods-producing percentage to shrink. Of the 11 nonrecovered states, only Wyoming had more goods-producing jobs at the end of 2015 than at the beginning of 2005. The increase is primarily a result of significant increases in construction employment. How much larger the job losses were peak to trough in the goods-producing sector compared with the service sector is shown in Table 5. Texas had the smallest percentage loss in goods-producing jobs at –15.4 percent, while Nevada experienced the largest loss at –51.8 percent. Although the recovery from the troughs was strong in some cases, every state and the U.S. overall ended up with fewer goods-producing jobs at the end of 2015 compared with their prerecession peaks. However, the net decline was significantly smaller in Texas (–1.3%). All other states and the U.S. had double-digit declines. 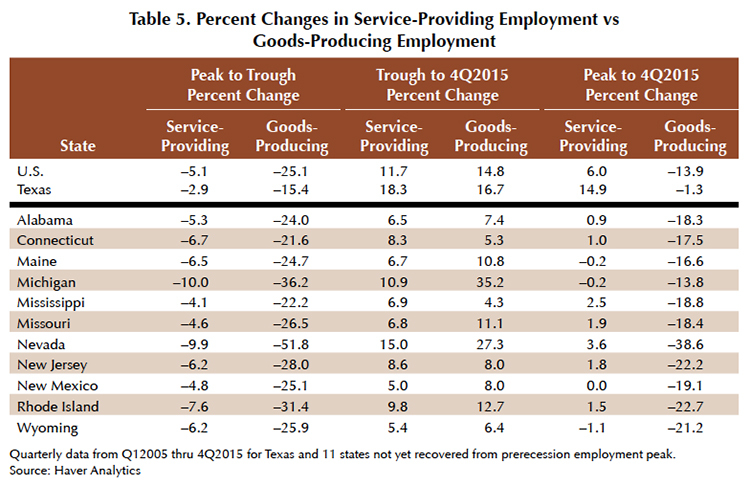 Service-providing employment is beyond or close to the prerecession peaks for the nonrecovered states and the U.S. overall (Table 5). One service sector subcategory, education and healthcare, never reached a trough during the study period in any region. The anchor holding back the lagging states is insufficient return of jobs in the goods-producing sector compared with Texas. Three subcategories make up the goods-producing sector: manufacturing, construction, and mining and logging. Data shows that manufacturing provided the bulk of goods-producing jobs in the U.S. overall and most of the nonrecovered states (Table 6). The exceptions are Nevada, New Mexico, and Wyoming. In Texas, about half the goods-producing jobs have been in manufacturing. The ratio of manufacturing jobs from 2005 to 2015 has declined in the U.S. overall and every state except Nevada. However, the Nevada increase is due more to a loss in the construction sector than a gain in the manufacturing sector. 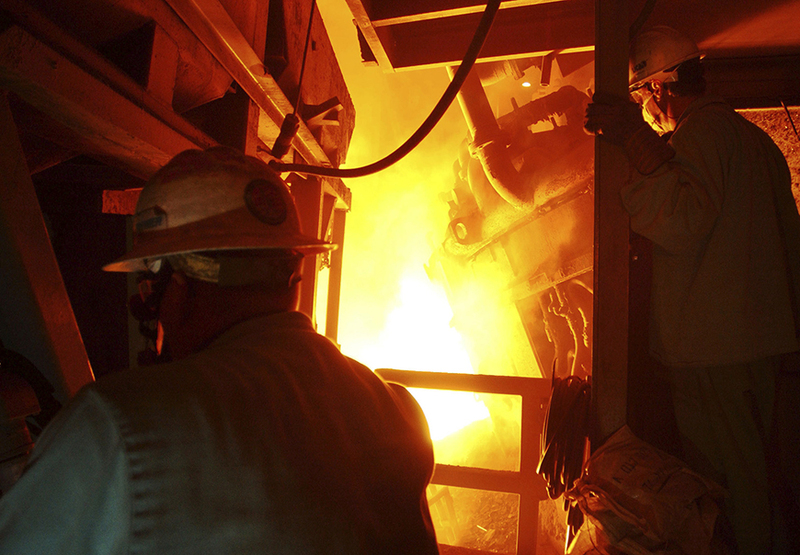 Nevada lost 4,767 jobs in manufacturing since the beginning of 2005. The construction subsector lost 51,767 jobs. The higher percentage of mining and logging jobs in Texas, primarily upstream oil and gas jobs, is evident in Table 6 as well. Even with the 2015 downturn in oil and gas activity, the sector still represented 14.1 percent of all goods-producing jobs in Texas. A number of factors have contributed to the state’s success, including a favorable tax and regulatory environment, affordable housing, and a good quality of life. These positive attributes have given businesses incentive to locate here, resulting in years of solid employment opportunities. The home price and employment numbers show Texas has consistently outperformed most of the country, especially the 11 unrecovered states, for more than a decade. Although the service-providing sector now dominates employment, the value of goods-producing jobs cannot be underestimated. Most of the goods-producing jobs are in “basic” industries that bring in revenue from outside the state while also promoting increased local service-sector job growth. They also typically pay higher salaries than the service sector. Wages paid per employee in goods-producing jobs averaged approximately 20 percent higher than service-producing wages from 1Q2005 to 3Q2​015 at the national level (Figure 2). This difference is present in all the unrecovered states and in Texas, where wages per employee in goods-producing jobs are on average 47 percent higher, one of the highest registered differences. 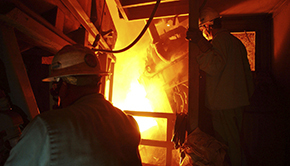 Unlike most other states, Texas has offered a more even mix of manufacturing, construction, and mining and logging jobs. While the manufacturing subsector continues its gradual decline, construction and mining and logging jobs tend to fluctuate both up and down over the long-term. As a result, Texas has been better positioned for future economic growth and less volatile home prices. Dr. Hunt (hhunt@tamu.edu) and Dr. Torres (ltorres@mays.tamu.edu) are research economists with the Real Estate Center at Texas A&M University.